Each classroom is under the supervision of an experienced teacher who carries out the preschool program with the assistance of at least one parent each day. 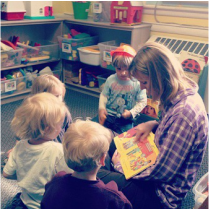 The CCCNS teachers are highly qualified and offer consistency, continuity, and a developmentally-appropriate learning environment. Tamara has a BA in Psychology from The College of Wooster and a MS in Early Childhood Education from Indiana University. Ms. Tamara has a vast knowledge base and provides a variety of classroom experiences. She helps children explore basic concepts through age-appropriate, themed activities. Ms. Tamara has been at Children's Corner since 2007. 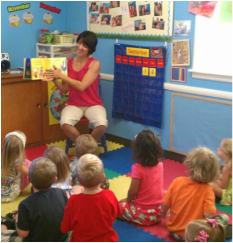 She taught the 2 year old classes as well as the Spring 2s class and is currently teaching the 4-Day Preschool Class. Rachel has a BS in Elementary Education from Indiana University and a Reading Minor. Ms. Rachel's love of nature and her advanced training as a reading recovery specialist provides her with a special skill set for fostering her students’ love of learning. Ms. Rachel has been a part of Children's Corner as a student, parent, board member, and teacher. Ms. Rachel began teaching at Children's Corner in 2006. She currently teaches the 5-day Preschool Class. Deb has a BA in Music Education from Coe College and a MA in Special Education from The University of New Mexico. 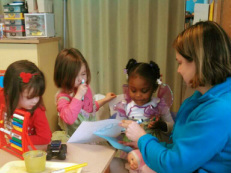 Ms. Deb began teaching two year olds at Children's Corner in 2011. With love and enthusiasm, she provides her students with a warm and inviting first-time classroom experience. Her class is a wonderful place for exploring and playing. Ms. Deb currently teaches the 2 year old classes. Amanda has BA in in Public Relations from Otterbein College with a minor in Art History. Ms. Amanda is our floating aide and substitute teacher. She has been a parent and a teacher at Children's Corner since 2011. She has also teaches our popular Special classes on Wednesday afternoons. Kate has a BA in History from The College of Wooster. Ms. Kate has been part of Children's Corner for more than 10 years as a parent, board member, and teacher. 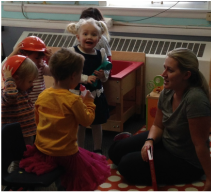 Ms. Kate's enthusiasm and previous experience provide a fun learning environment, where preschoolers get an introduction to the world of letters and numbers through exploration, movement, and play. Ms. Kate currently teaches the 3-day Preschool Class.